Leadership for Christians in the public sphere is, in the words of former BBC journalist Christopher Landau, a sort of “elegant dance". On the 1 and 2 of February, 17 emerging leaders who want to improve their own dance between their faith and the requirements of their work, met for an inspirational and challenging weekend retreat to grow in their positions of public leadership. The Public Leadership team has gathered together an incredible group of speakers from a range of sectors. On Saturday, Christopher, who was formerly a producer and religious affairs correspondent for the BBC and now works as a chaplain to postgraduate students, discussed how Christians can engage with the media most effectively. He addressed the paradox that while people appreciate Christian principles such as social justice, they do not appreciate the God behind the principles. In his experience he found that a Christian message would often be received better when presented in a non-Christian way. But, he stressed, this does not mean Christians should shy away from being unmistakably Christian when the opportunities arise. Christopher also spoke about the importance of how Christians interact with each other when in the public eye. He explained that when Christians attack and undermine each other, it is hard for the public to believe that these are the people who have an unshakeable hope. He left us with a challenging Bible passage, which he believes is at the heart of how Christians should engage with each other and the media: ​“With the tongue we praise our Lord and Father, and with it we curse human beings, who have been made in God’s likeness. Out of the same mouth come praise and cursing. My brothers and sisters, this should not be” (James 3 9 – 10). Christopher was followed by Chloe Lynch, a lecturer in Practical Theology at the London School of Theology. Her message centered on how important it is for Christians in positions of leadership to understand the dynamics of power. Chloe talked about the different forms of power, the ways people attempt to obtain it and, most importantly, how Christians should behave in the context of gaining and maintaining power. Chloe stated that Christians cannot deny the power they have, and that if Christians don’t lead, someone else will. Chloe went on to discuss the importance of a Christian leader staying faithful in their relationship to God, so that if or when their leadership is challenged, they can stand firm. She has found that if she is where God wants her, and she is faithful to Him, then a way through obstacles always opens up. The scripture she ended with was Luke 22:24 – 30, in which Jesus talks about servant leadership and how the greatest must be like the one who serves. 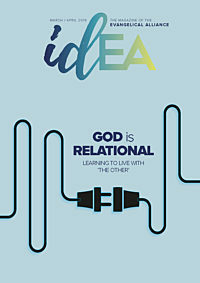 At the heart of both presentations was the significance of relationship, with God and with others, Christians and those of other faiths and none. The emerging public leaders who attended the seminar will have no doubt returned to their places of work with a better understanding of how to foster and maintain effective relationships on their professional journey, all the while keeping God at the heart of everything they do. The Public Leader course for 20s and 30s runs in England, Northern Ireland and Scotland. Kaiya Huilett, an intern with the advocacy team, attended part of the first retreat for the England 2020 cohort.